I was so excited to be a part of Emily and Mickey's wedding! This day was so full of love, you could just feel it exuding from Emily and Mickey and all their friends and families. 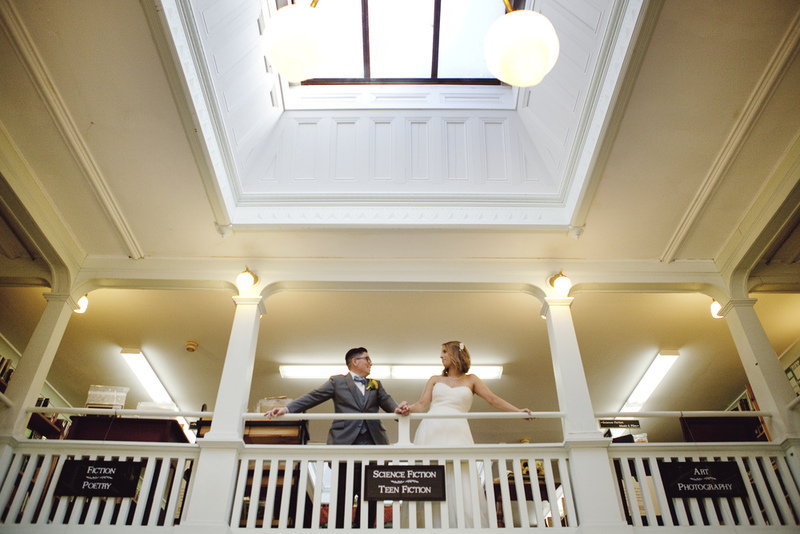 In the 100+ years Eureka Books has been around, this was the first wedding held there - it was such an amazing space and perfect for the couple since they love books and it's Mickey's favorite bookstore. Emily's godfather officiated, and they had a reading of the most beautiful poem in both Spanish and English which brought everyone to tears...twice. Also, hello cutest flower girls and ring bearess EVER! The reception was a blast and included some of the most heartfelt toasts I've ever witnessed. Congratulations, you two! Ceremony venue: Eureka Books - The proprietors of this amazing store were so kind and couldn't have been more gracious and accommodating. Reception venue: Humboldt County Office of Education - This brand new, gorgeous space and its excellent staff kept things running smoothly all evening. Photography: Sacred Images - Jan and her second shooter Darci created beautiful images that perfectly captured the day! They were everywhere during the ceremony (climbing a ladder, looking down from the balcony) to make sure they didn't miss a thing. Catering: Uniquely Yours Catering - Wonderful food and lovely staff who worked so hard to make the reception a success. Dessert: Verbena Cakes - Cream puffs, fruit tarts, macarons, peanut butter sandwich cookies, white chocolate lavender truffles...WOW! This was the ultimate dessert buffet. Florals: Emily's aunt Sally put together all of the beautiful, bright arrangements - those sunflowers added pops of color throughout the day! DJ: Accurate Productions - These guys really kept the dance floor packed - everyone was having so much fun that we extended the reception! Makeup: Nicole Marie Makeup Artistry - Nicole did an amazing job keeping the makeup fresh, beautiful, and natural. Plus she is the sweetest!